There comes a point where people develop certain expectation when they hear a game is a first-person dungeon crawler. Long slogs into labyrinths to map out their intricacies, character management, devious traps and hours spent exploring all come to mind. But this is not necessarily the case with The Lost Child. 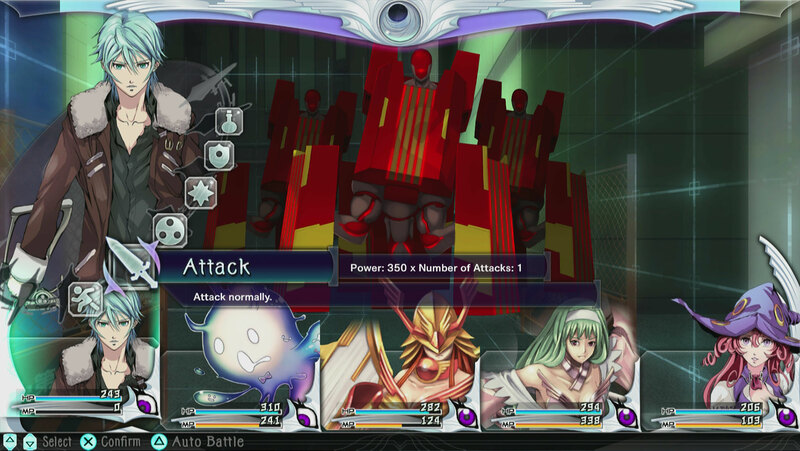 This game mixes in elements from other genres, like visual novels. 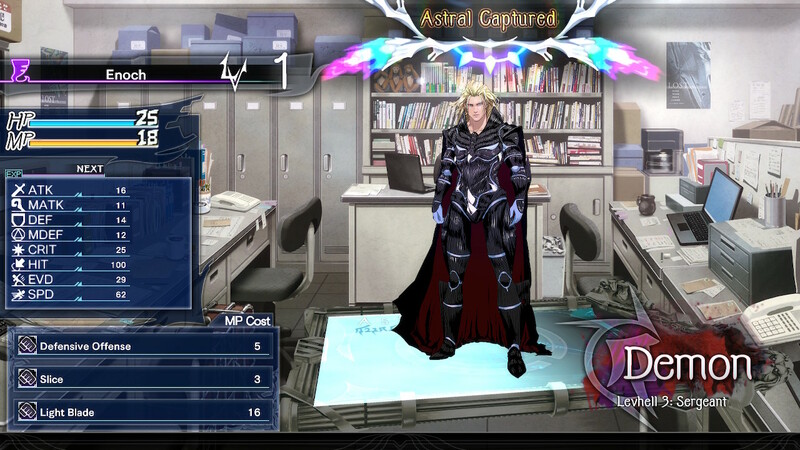 It inhabits the same world as El Shaddai: Ascension of the Metatron, Director Takeyasu Sawaki’s previous game. It even factors morality into party building. It is an interesting blend that helps stave off monotony and offer additional intrigue. While The Lost Child is set in the same world as El Shaddai, do not let that discourage you from giving it a try. The story here is self contained, with characters like Enoch, a potential party member, and Lucifel, a former angelic influence acting as an NPC Traveler of Time, showing up as happy coincidences. What really matters is this: the forces of heaven and hell are at war. Our avatar, the newest journalist at an occult magazine, is nearly killed by a demonic force that attempts to push him in front of a subway train. Balucia, an angel, declares him the chosen one and gives him the Demon Gun Gangour before disappearing. Her twin sister, Lua, has been sent by the Archangel Michael to aid us in our journey and maybe find her missing sibling along the way. Essentially, there is a war between the forces of good and evil that could destroy the entire world as we know it in The Lost Child, and an “ordinary” man named Hayato Ibuki is caught in the fray. 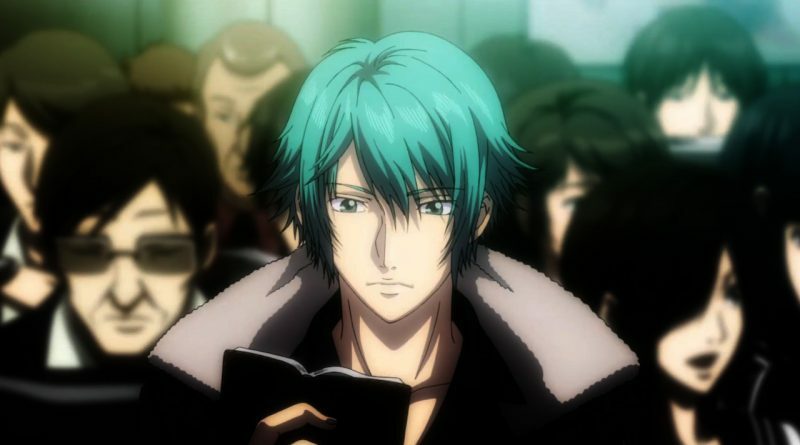 Essentially, there is a war between the forces of good and evil that could destroy the entire world as we know it in The Lost Child, and an “ordinary” man named Hayato Ibuki is caught in the fray. What really helps sell this idea is the fact that he was working for Lost, the paranormal magazine, prior to these events and continues to carry out his duties there as he goes about saving the world. Missions are broken up into Investigations, which may or may not be tied to the main story. These will send you to eight locations around Japan where you can investigate and talk to people, with these then leading you to Layers, dungeons that exist outside of our normal comprehension. It is interesting, because this involves a bit of legwork and happens to be where the visual novel elements come in. The Lost Child’s story segments are rather succinct and do not wear out their welcome, but do require you to pay attention. 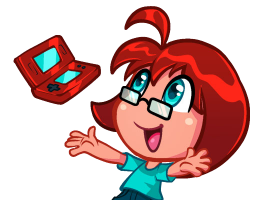 Information is not recorded in the game anywhere, which means it may be possible to forget exactly what you are doing if you return to a past save. Lua will offer hints as to your motivations sometimes and you have a basic Investigation Report with current summary of what is going on, but it feels like the game wants you to really invest in two or three hour play sessions at a time. This is not a bad thing, but it is best to complete an Investigation before calling it a day. Once you find yourself heading into a Layer, you will see that The Lost Child does not mess around. I do not mean that it offers ridiculous or unfair challenges. This is a game with difficulty options and enough save points in logical places to help you stay alive, as well as a system that allows you to pay in-game cash or Karma to return to the game if a battle kills Hayato and causes a dreaded Game Over. Rather, it does not hold your hand. Every Layer has its own gimmick to it. As an example, the Akihabara Layer has a series of mine carts that shuffle you around the space and doors that only open after switches are flipped, requiring you to keep a close eye on where you have been and where you are going. Minakamiyama has pits that will drop you to lower levels or floor tiles with magma on them that cause everyone in the party to lose health when you walk over them. Something is always happening, forcing players to stay aware. 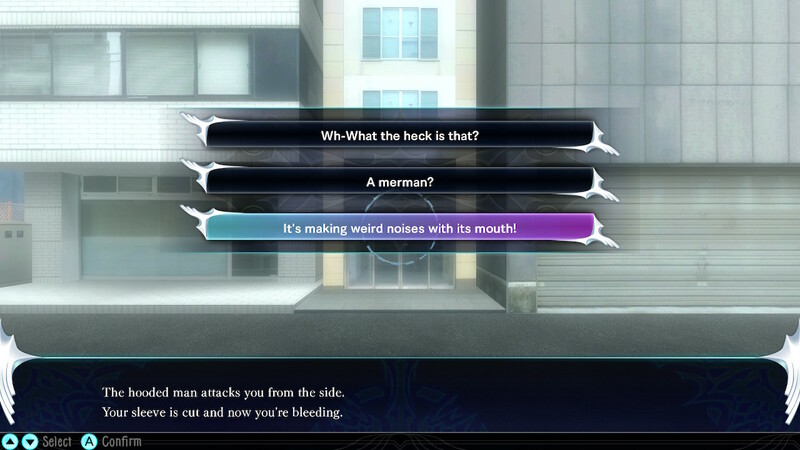 The actual battles in The Lost Child are, for the most part, typical turn-based affairs. Hayato and Lua function as normal characters, as they have standard attacks, can use skills, may equip items and earn experience from each encounter. Astrals are various creatures you have fought and turned to your side with the Demon Gun Gangour and Hayato’s capturing skills to make them your own. They do not level up in a traditional manner and can not equip items, but could learn new skills from battle or be used as ammo for the Gangour so Hayato can use a special attack. As you fight the enemy, you must try to exploit weaknesses and keep an eye on how hostile foes are toward allies to determine who could be targeted, all in the name of survival. The Astrals are The Lost Child’s most interesting elements, given how they work and tie into the Karma system. The Astrals are The Lost Child’s most interesting elements, given how they work and tie into the Karma system. You receive three different kinds of Karma, depending on dialogue choices you make during visual novel segments and the enemies you fight. Depending on alignment, Astrals will require a certain Karma sum to be purified, so you can use them, then additional amounts of Karma to level up. Once certain level plateaus have been hit and items collected, you can EVILve Astrals to change their form and increase their power. If there is one you have that you really like, perhaps due to their appearance or general utility, you can Reset them after hitting a later plateau for a major stat increase, sending them back to their original form at level one. It is a system that encourages you to think about your decisions, work with creatures and reinvest in them, rather than ditch ones you like for newer models. While The Lost Child is a largely pleasant experience, there is one issue that I have found frustrating. For a game where there is quite a bit of important text, it does not always lay things out in a way that is appealing and easy to read. All of the text boxes do not make full use of the space, forcing the small font into approximately a third of its space. On loading screens, only half the text box is used, with odd line breaks turning an informative sentence into the world’s strangest haiku. It can be very distracting, due to its pervasiveness. Especially since The Lost Child is a game someone could be playing for a long time. No, wait, a very long time. 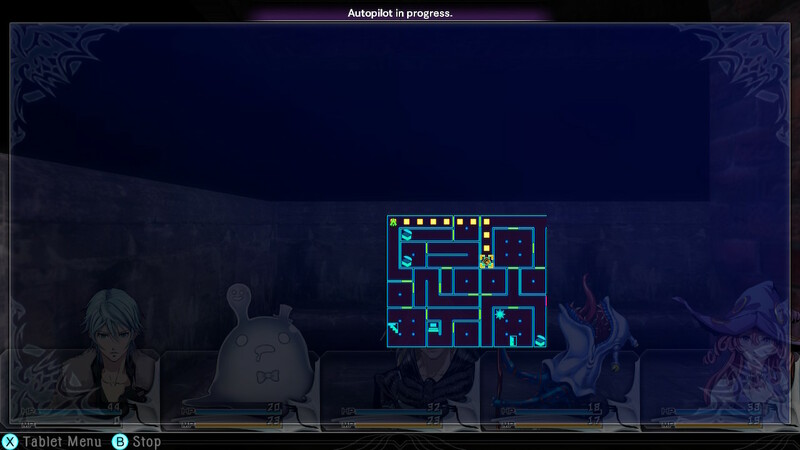 In addition to the main game, there is a substantial post game with an additional area, more Astrals and extra Investigations. There is a lot to do here, with additional challenges that gradually increase difficulty in a satisfying way and offer new creatures that you might find yourself wanting to fight and befriend. Some text formatting issues aside, The Lost Child is the sort of game that some people will consider a big deal. By some people, I mean those who care about first-person dungeon-crawlers with turn-based battle systems. There is so much to do here, both in the main story and after the credits roll. Astral collection and growth is handled well. The visual novel segments are interesting and never overstay their welcome. Each Layer dungeon has a distinctive look and feel to them. It will definitely find a prominent place in the libraries of people who appreciate such things.